Group Discussion Ideas > Social GD Topics > Farmer Suicides in India – What needs to be done? Farmer Suicides in India – What needs to be done? Overwhelming debts to banks and money lenderers. Incapable economic condition of farmers leads them to borrow loans. Though local moneylenders are usually portrayed as the main culprits, legal data shows that 80% of farmers killed themselves in 2015 because of bankruptcy or debts after taking loans from banks and registered micro-finance institutions. The average size of land holdings in rural India has halved over the past twenty years. Many poor farmers are left with less than one hectare land. Though debt is the main cause of farmer suicides, there are reasons like social disrepute, health problems, addictions, high expenses for marriages, disputes with others etc. All these causes are inturn linked to financial distress. In a report submitted by Radhakrishnan, it has been stated that in rural India many of the farmer loans are for marriages. It is a social obligation to spend well on weddings, which sometimes includes dowry. Sowing water intensive crops, and depending heavily on rainfalls. Increase in the compensation given to immediate kin, is also one of the causes for farmer suicides. In the union budget 2017-18, Indian government aimed at doubling farmers’ income in the next five years. ‘Soil Health Cards‘ scheme is one of the best programs for farmers. Through this scheme, farmers will get a well-monitored report of the soil in their land, so that best crop for the soil can be selected. Indian government is providing crop insurance under ‘Pradhan Mantri Fasal Bima Yojana‘ (PMFBY) program. ‘Agriculture Produce and Market Committee (APMC) act’ was implemented to develop efficient marketing system for agricultural produce. ‘Mahatma Gandhi Rural Employment Guarantee (MNREGA) Act’ was introduced to ensure jobs to the rural population during non-farming seasons, so that migration of agrarian community to cities in search of jobs can be curbed. Maharashtra reported the maximum number of farmer suicides in 2016. It has launched a water conservation scheme named ‘Jalyukt Shivar Abhiyan‘ to make Maharashtra a drought-free state by 2019. Maharashtra state government aimed to become zero farmers suicide state in year 2017 and 2018. It launched ‘Baliraj Chetana Abhiyan‘ which is replacing more than 100 schemes for the upliftment of farmers through a holistic approach of socio-economic development model. Larger land holdings can be one of the solution to prevent the farmer suicides in India. Size of land holdings can be increased by promoting practices of land pooling and through collective farming. The present ‘minimum support price’ for agricultural produce is not even sufficient to repay the loans. MSP needs to be increased. The reasons for farmers suicides vary from state to state. For example, in some states lack of rainfall is causing crop failures. For that, crops that need less water should be promoted. States should identify their problem areas, and needed to work on that. This will be helpful to farmers more than the nation-wide programs. Easier access to credit loans. Reducing input costs and encouraging organic farming practices. Conducting awareness programs on crop insurance schemes. Implementing advanced technologies in agriculture leads to increase in productivity. Farming profession is considered as high stress profession not just in India but also in some other countries like Sri Lanka, USA, Canada, England and Australia. Large land holdings and introduction of advanced farming technologies have succeeded in improving the farmer’s life in developed countries. Though there are many schemes for improving the lives of farmers in India, the programs are not being implemented effectively. Implementing advanced technologies and encouraging organic farming practices and the effective implementation of schemes can together solve the problem of farmer suicides. According to me farmers take loan from bank or local money lenders for firming or social problems like daughter or son wedding whatever it is may be that year due to flood or drought crops have damaged ,they incurred huge loss. Pradhan mantri fashal Bina YOJONA is good but farmers they will get more money accordingly they will compensate, little relaxation from bank for rate of interest and extra time to repay the loan ,then they don’t need to take stress ,they will think next firming they will earn and repay the loan. As a result if they don’t have stress they will not commit suicide . Already Prime minister various scheme for farmers ,if they are in trouble Govt should take care of them. Very burning and concerned topic sir….. Glad to add my views….. It may be noted that 65% of the total workforce in india belongs to the Agriculture sector, which contributes about 15% to the country’s $2 trillion economy. I think… The most apparent reason for the distressful plight of the Indian farmers is that 80% of them are small and marginal farmers,who are dependent for their survival on less than five acres of land. Nearly 50% of rural households belongs to this category. India with its diverse land mass is also subjected to diverse furies of Nature as you said… It is estimated that 70% of the country’s arable land is prone to drought, 12% to floods and 8% to cyclones. 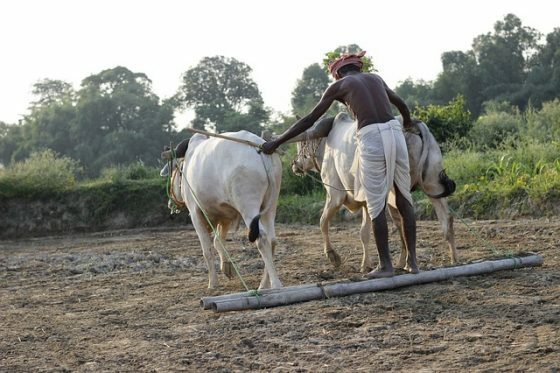 According to the National crime records bureau, more than 5500 cases of farmers suicide are recorded in india annually, out of them half are recorded from Maharashtra alone. According to a report, in india farmer suicides account for about 11% to the overall suicides committed. I think govt is also concerned about this burning problem…. In April, govt had set up an expert committee to scrutinize the functioning of the “NATIONAL POLICY FOR FARMERS “, so as to identify and address the specific reason for farmers suicide……. Recently govt also announced that it would re-examine the basis of working out MSP, as u suggested above, so that it allow risk free farming and Cutts losses. Govt has also earmarked Rs 61000crore something for 2015-20 to provide relief to the states which may be hit by various natural and Manmade disasters. The Agriculture ministry in consultation with the NITI Aayog has identified a set of nine marketing reforms to ensure remunerative prices to farmers for their produce. These measures are likely to be placed by this month and are considered to be one of the key steps of the govt to live up to its promise of doubling farmers income by 2022. I also think sir….. Moneylenders charging the farmer’s exorbitant rate of interest must be identified and punished for running such a racket……Institutionalized credit system e. g. JAN DHAN YOJANA, MUDRA BANKS must be simplified and farmers be made aware of their rights and govt’s initiatives in this regard. I think NGOs with a vision of eco-friendly sustainable development should guide the farmers to make the efficient use of water, electricity, pesticides and other inputs. I think…. It is very unfortunate that the Nation as a whole has failed to appropriately strengthen the hands that feed us..